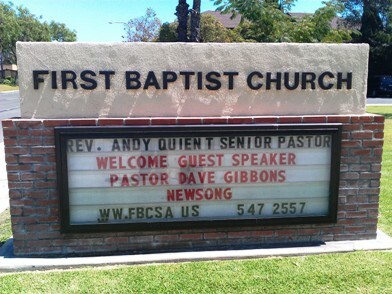 Can Newsong bring new life to Santa Ana’s First Baptist Church? William H. Spurgeon, the founder of the City of Santa Ana, purchased seventy-six acres of land from the Yorba heirs in 1869 and laid out what was to become the Orange County seat. With only six or eight homes in the place and about one hundred fifty souls, thirteen people organized First Baptist Church of Santa Ana on a Saturday in March of 1871, at the local school house. 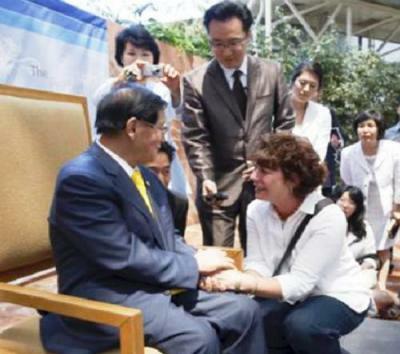 Editor’s Note: The press release below is a follow-up to the appearance by Korean bible instructor Man Hee Lee at the Christ (formerly Crystal) Cathedral in Garden Grove on July 21. The New Santa Ana blog’s coverage of that event was referenced in a Washington Times article about Lee that was published on July 31. 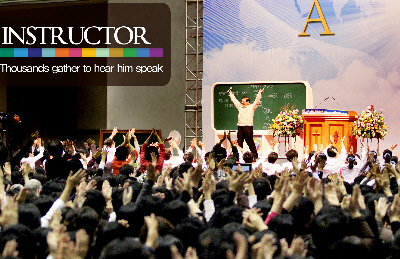 UPDATE: According to Eric Lee, “We had over 600 request to follow up and learn more about the instructor and also the fulfillment of Revelation.” Click here to see the official event follow-up press release. And click here to see more pictures taken at this event. 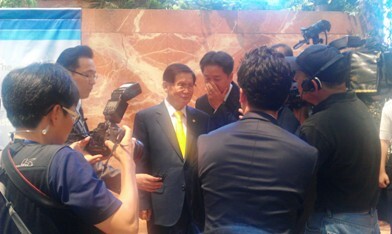 I visited the former Crystal Cathedral today (it is now knows as Christ Cathedral), where throngs of mostly young Koreans and other believers came together to listen to the ministry of Instructor Man Hee Lee, a self-avowed expert on the Book of Revelation. 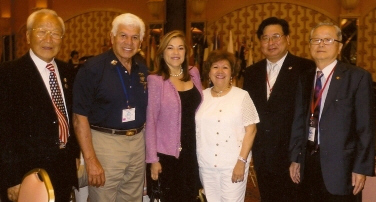 WASHINGTON, D.C. – Congresswoman Loretta Sanchez (CA-47), co-chair of the Congressional Caucus on Korea today issued the following statement congratulating Korea on the March 1st Movement. Rep. Sanchez also today submitted a statement for the Congressional Record, which is attached. 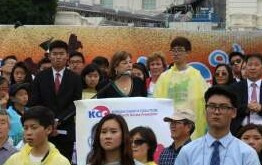 “On behalf of the American people, I congratulate the Republic of Korea on the 92nd anniversary of the Korean independence movement,” said Rep Sanchez. “On this occasion, we recognize and pay tribute to the spirit of an earlier generation of Koreans who, in 1919, bravely protested Japan’s colonial rule. This resistance by the Korean people resulted in major changes in Japanese imperial policy and unified Koreans in their desire to live in a free and independent country, a desire that Americans very much understand. IRVINE – Hollywood’s hottest DJs and the world’s hottest dancers heat up the Great Park this weekend as Flights & Sounds Summer Festival celebrates contemporary dance. Join in the fun as DJ Casey Conner and DJ Hapa move the turntables and rock the crowds. Then, catch the acrobatic moves of Korean b-boying break-dancing sensation Last for One. 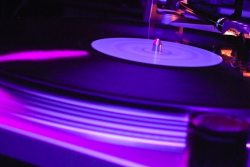 It’s a DJ House Party at the Orange County Great Park on Friday, August 20thth at 8:00 p.m. where you will want to dance to the beats of today’s most in-demand DJs. DJ Hapa has rocked the hottest clubs and events across the world, and is the DJ for the KTLA morning show. DJ Casey Conner’s dynamic approach to spinning the turntables has made her one of the most sought after celebrity DJs in Hollywood. Come early and get ready to dance with a little help from Great Park dance instructors at 7:30 p.m. DJs start spinning at 8:00 p.m.
Come back to the Great Park on Saturday, August 21st at 8:00 p.m. to see Last for One, the Korean hip-hop break dancing crew that has helped bring mainstream attention to an underground art. Last for One are the winners of the 2005 International Battle of the Year, and have since become internationally recognized b-boy kings. Before Saturday’s performance, visitors can enjoy the Great Park Comedy Corner at 7:00 p.m. featuring Dante with special guests Rebekah Kochan and David Marley. Admission to Flights & Sounds Summer Festival dance and concert series is free, and parking is just $10. Upcoming 2010 summer performers include a wide variety of first-rate artists, featuring five-time Grammy Award-winning Blind Boys of Alabama, local surfing champion and artist Donavon Frankenreiter, Hector del Curto’s Eternal Tango Quintet and Big Sandy and His Fly-Rite Boys. Flights & Sounds Summer Festival is presented by the Orange County Great Park Corporation in partnership with Irvine Barclay Theatre. Concertgoers can watch the show from chairs provided in a temporary concert pavilion or bring their own chairs to listen to the music from the Great Park Lawn. Before each performance, Hangar 244 is transformed into the Hangar Café, a lounge-like dining area serving up everything from snacks to full dinners, along with refreshments. The menu features themed items inspired by the global mix of musicians, and visitors can choose to also pre-order their picnics by visiting www.ocgp.org. The Orange County Great Park is located off the 405 or 5 Freeways at Sand Canyon and Marine Way in Irvine. Admission is to Flights & Sounds Summer Festival dance and concert series is free, and parking is just $10. The Orange County Great Park with its 1,347-acre master plan is the focal point of the redevelopment of the 4,700-acre former Marine Corps Air Station, El Toro. The Great Park is currently 27.5 acres and includes an iconic tethered helium balloon that rises 400 feet in the air, providing an aerial view of Park development. A $65.5 million development plan to expand the Park to 200 acres is currently underway. The plan will build out a core section of the Park for the most immediate and wide-ranging public benefit, including a sports park, agricultural area and an art and culture exhibition space. For the entire festival line-up and more information, go to www.ocgp.org. Kogi BBQ trucks coming to Santa Ana this week! The popular and beloved Kogi BBQ food trucks are coming to Santa Ana! “Kogi said it would soon start making five nightly stops a week in Orange County. With the birth of Naranja truck (the Los Angeles trucks are called Verde and Azul), regular food stops begin this week in the cities of Santa Ana, Costa Mesa, Anaheim and Orange,” according to the O.C. Register.